All passenger services between Belgium and Germany are normally routed via Welkenraedt and Aachen Hbf, running on infrastucture which has remained unchanged (apart from renewal of the Hammerbruck over the Gueule) since electrification (at 3 kV DC) in 1966. The need to adapt it to satisfy modern requirements, notably the operation of very high-speed Thalys and ICE trains, has long been evident, but until recently little information on the railway's plans for doing so has been available. Even now, full details are not known. The contributions in the following series address various aspects of the requirements and relevant constraints; some include possible solutions. I suspect that the basic problem for the DB and SNCB is to know what kind of trains will be operated on the Welkenraedt - Aachen line (apart from Thalys and ICE 3, that is). There is already a clear trend towards eliminating local cross-border services, by means of discriminatory tariffs (see the letter to Today's Railways copied below). but as this is quite absurd, it may be reversed at any time if there is a political will to do so. And the future of overnight long-distance servces is similary uncertain, as the disposal of the Nightstar stock shows. There are reports here that a "class 14" multivoltage loco (at least 3kV and 15kV, and probably with 25kV too) is under study, if possible based closely on one of the new DB types. But the crazy economics of the market suggest that a big diesel (like the UK class 66) would be be best choice from a purely commercial (= return on investment) perspective (unless the price of oil goes up again...). So I don't expect a decision soon. I was very interested to read your report on plans for substantial investment in the French rail network, on pp30-37 of TR57. As you point out, the Regional Authorities now play an important part in defining priorities and in helping to fund new infrastructure and operating expenses. But unfortunately you omitted to mention that - probably inadvertently - this involves strong incentives to fragment the overall network into regional 'islands' with few if any convenient links between them. A particular case is the cross-border link between Jeumont and Erquelinnes - a four-minute journey that could and should provide interconnections between the regular-interval services on the Belgian rail network and those of the French Region Nord/Pas de Calais (Nord-PACA). Until the Belgian timetable was revised following completion of the high-speed line between Fretin (Lille) and Lembeek (Brussels), the majority of trains between Charleroi and Erquelinnes called at Jeumont - either to change motive power or as their terminus, because this is the boundary between the SNCF's 25 kV AC and the SNCB's 3 kV DC system. And until the end of May 2000 there were also six trains linking the Nord-PACA network at Aulnoye with Mons. But now most of the SNCB's hourly EMUs between Charleroi and Erquelinnes have a layover of 34 minutes there, as only three run through to Jeumont on weekdays - and none at all on weekends. No doubt the railways claim that there is little demand for through travel here. But that is the inevitable consequence of their policy of applying heavy surcharges to all cross-border ticket prices, while offering substantial discounts for travel wholly within their own networks. Within France, many rail travellers enjoy automatic 25% "DÈcouverte" discounts (50% if they hold the appropriate railcard), while within Belgium they can buy cheap "pass" tickets at a price that takes no account of the distance travelled - but are valid only between pairs of SNCB stations. Of course, the regional authorities that help to finance these discounts argue that they are only trying to ensure that the main beneficiaries are their local residents (and taxpayers), but they seem to be unaware that this price discrimination against links *between* regional networks is also deterring potential visitors and customers from other regions. This problem is largely concealed by the way in which the most widely available rail timetables are now presented on a regional basis (indeed, the Leader comment on SNCF timetables in TR57 disregards the free Regional (TER) Guides and leaflets, as well as the impact of the Minitel service mentioned on p.46). Similarly, the Belgian printed 'Indicateur officiel' fails to show the hourly all-stations EMUs between the first station in the Grand Duchy, Kleinbettingen, and Luxemburg Ville in Table 162 (Namur - Arlon - Luxemburg) which, until a few years ago ran through to/from Arlon to give connections there with the IC service between Brussels and Luxemburg Ville. No doubt you are aware of other examples. I therefore urge you to draw attention to this absurd and unwanted fragmentation that is preventing full advantage from being taken of the major investment in regional rail networks, and to campaign against it through your columns. Please realise that I did not then know that the SNCB envisages continuing the high- speed line alongside the motorway between a point a few km south of Welkenraedt and somewhere near Walhorn. In that case the obvious location for the 25 kV/15 kV transition would be near the junction between the high-speed line and the existing line, just south of the Hammerbrücke near Astenet. BTW you should get the LVA Freizeitkarte sheet 22 (Aachen Jülicher Börde) to see this area in detail, with contours - you can see from it that close to the B/D border the classic line has been realigned north of Hergenrath. My thoughts on the power c/o arrangement have evolved over time, in accordance with the expected operational requirements and the route of the high-speed line. SNCB 2733 just arrives at the end of the steep grade to Aachen-Süd with its IC Cologne - Ostend. Banking DB 225 026 leaves the train and will return downhill. I was alarmed to read in TR 43, p49, that apparently only Thalys TGVs will provide a daytime rail service between Belgium and Germany via Line 37 once the SNCB's class 16 and 18 multi- voltage locos reach the end of their lives. Of course it would not be economic to order new rolling stock equipped for operation under both 3kVdc and 15kV ac just for this short cross-border application, but there are several other options which could and should be considered for carrying the traffic for which Thalys is unsuitable and inappropriate. Although any comparison with the SNCB's other short international routes must take account of the fact that the potential demand in each case is limited by the linguistic factor, it is interesting to note that the service between Belgium and France via the 'conventional' lines 75 and 78 (formerly 94) has been greatly improved, rather than discontinued, since the inauguration of fast and frequent high-speed service between Brussels and Lille. These 'conventional' services carry not only those local travellers who would regard compulsory advance reservations in both directions and the un-availability of through ticketing to stations at which the high-speed services don't call as a major deterrent, but also numerous pass-holders, cyclists and people who just want to avoid the hassle and expense of car-parking in the Lille conurbation. In the case of line 37, thus, a similar alternative to Thalys should consist not of the present Intercity express operation at intervals of not less than two hours, but hourly semi-fast trains enabling travellers from Eupen in the German-speaking area and other important stations on line 37 to reach Aachen (and vice versa) without a long and costly detour via Liège (as Thalys does not stop anwhere between Li?ge and Aachen). In principle, this could take the form of extending, from Welkenraedt to the present end of 3kV power, Aachen Hbf. (17 km, taking about 14 minutes), at least a two-car EMU from the hourly stopping trains that currently run on Line 37 between Li?ge Palais and Welkenraedt - once the single-track bottleneck existing while the Hammerbruecke is rebuilt has been removed. But if, as the DB has been reported to be planning, the voltage-changeover point is relocated several km further west, then it would be preferable to locate it at Herbesthal, 1 km east of Welkenraedt, with a short 15 kV spur into a platform between the main running lines at Welkenraedt station, which could then become the terminus for semi-fast EMUs from Koeln Deutz or points east. Some such arrangement will be needed there in any case to enable the locomotives on overnight trains to be changed - unless these are all cut back to Koeln, or Aachen at best... Indeed, as the future high-speed line between Li?ge and Aachen will presumably be electrified at 25 kV, at least as far as Welkenraedt, locating the voltage changeover point at Herbesthal, where it diverges from the 'classic' Line 37, is the obvious way to rationalise the power arrangements on it as well. The new line for TGVs will pass via Walhorn (Lontzen), not Welkenraedt. This was decided last week, at the last meeting of the SNCB's Administrative Council. And, the high speed line between Liège and the German border won't be taken into use until 2006, one year later than was planned. The SNCB has been considering its choice between this and upgrading the existing L.37 east of Welkenraedt for some ten years. The section concerned begins at the Grünhaut forest, after the section near Herve, and ends just short of the recently rebuilt Hammerbrücke viaduct on L.37. The existing line 37 runs via Welkenraedt, while the proposed high-speed line would run along the southern side the E40 motorway as far as Waldhorn, where it would pass beneath the E40 in a cutting and head north towards the Hammerbrücke. The route via Walhorn would cost less (BEF 5.6 billion instead of 5.9 billion), as well as causing less environmental impact, needing demolition of fewer buildings (6 instead of 15) and save 2 minutes in travel time. While this choice has been welcomed at Welkenraedt, the local authority at Lontzen has expressed its concerns. These are about the expected noise level, and so the railway is being urged to provide noise-absorbent walls and other forms of protection. These include temporary access to the motorway for traffic to and from the construction site, and financial compensation for the nuisance. Of course, this doesn't explain what power supply arrangements will be made, but it seems likely that there will be a single changeover between 15 kV and 25 kV for Thalys and ICEs near the Hammerbrücke (assuming that the 3kV catenary no longer continues as far as Aachen Hbf). As this is only 6 km from Welkenraedt, and there will be few if any locos able to switchover between 3 kV and 15 kV on the move, it would appear logical to perform the changeover in Welkenraedt station (eg with switchable catenary at a few platforms, like that at Aachen). I'll let you know if I hear anything more about this. 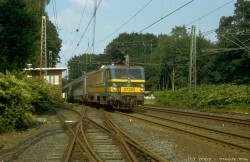 When the rebuilding of tracks between Köln and Düren is finished in 2002, SNCB class 16 multivoltage locos will no longer be seen hauling international trains between Köln and Oostende. This decision is based on their lack of German cab-signalling LZB (Linienzugbeeinflussung) equipment and the 160km/h top speed of the 5 locos still inservice. The line will be suitable for 250km/h. The "D-trains" now running every two hours between Köln and Oostende are going to be replaced by ICE3 services soon after the new high-speed tracks Ans - Leuven are operational. The final destination of these trains is still unknown. It might be Brussels, but there are also rumours saying Paris or Oostende. Because Oostende is a popular destination for people from Northrhine-Westfalia, the DB AG is in favour of trains running through to this port on the Northsea. The new high-speed tracks Ans - Leuven will be equipped with the TVM cab-signalling system which means so far they can only be used by SNCB class 13 and Thalys/ICE-trainsets. Rebuilding/upgrading of Leuven - Brussels is supposed to be finished in 2005. The new trains between Germany and Belgium will be multiple-voltage ICE (DB class 406) like those already in service between Köln and Amsterdam since the end of 2000. 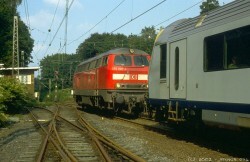 When the new high-speed Frankfurt - Köln line opens, probably in autumn 2002, these ICE3 trainsets will run to and from Frankfurt and be scheduled to offer, in alternation with the Thalys PBKA TGVs that already run every two hours between Köln and Paris via Brussels, an hourly high-speed service between Köln and Brussels, calling at Aachen and Liège. It is envisaged that every two hours a train consisting of two ICE3 units should start in Frankfurt and split in Köln, with one unit running on to Amsterdam and the other to Brussels. The international service with PBKA Thalys trainsets will continue to terminate in Köln (with one service daily extended from/to Düsseldorf), because when operating with the 15kV 16,7Hz of the new line to Frankfurt these TGVs are not powerful enough to climb its steepgrades at full speed. Another option is hourly double-tractions of ICE3 starting in Frankfurt consisting of one 403 and one 406 as far as Köln, because DB AG will suffer from a shortage of multivoltage trainsets. The 403 would continue alone towards the north of Germany, and the 406 might run beyond Köln alternately to Brussels and to Amsterdam via Duisburg. Class 27 is now the only other SNCB class of locos with permission to work to Aachen Hauptbahnhof. No locos of the older classes 22 and 23 have been seen there since several months ago. And there seems to be little prospect of the proposed new SNCB multivoltage class 14 locos as replacement for class 16 locos, since there are speculations that more class 13 locos suitable for 3kV DC and 25kV 50Hz will be ordered by SNCB. So far as the new line from Walhorn to Liège is concerned, it is difficult to predict the location of the voltage changeover point. If the changeover point from 15kV to 25kV is somewhere on open track between Aachen and Welkenraedt, multiple-voltage (or diesel) motive power will be needed again for night-trains or seasonal trains. But if it remains at its current situation (Aachen Hauptbahnhof), locos will have to change from 15kV AC to 3kV DC in Aachen and from 3kv DC to 25kV AC a dozen kilometers further on! Construction of what will be the longest of the 115 rail tunnels in Belgium is now in progress along the 6.2 km between Vaux-sous-Chèvrement and Soumagne, east of Liège. Once it and the rest of the new high-speed line is complete, which should be by December 2006, high- speed trains like Thalys and ICE will take only 1h 39m between Brussels and Köln - a saving of 53 minutes compared with the 2h 32m needed today. Excavation of the tunnel will involve moving some 40 thousand 20 m2 lorry-loads, where possible through its future portals. However, in order to save time two more working faces are being accessed from the foot of a shaft near its mid-point, at Bay Bonnet on the south-eastern outskirts of Fléron. Work underground continues day and night, but spoil will not be removed on the surface at night nor on the weekend after 14h on Saturday. The tunnel, which rises some 150 m towards the east, is being driven through schist similar to that overlying the coal measures that were formerly exploited further north, and some of the 300 people employed on the site have earlier experience in the mining industry. Much of the rest of the new line will run along the south side of the E40 motorway, for some 21 km between the eastern portal and its junction with the existing line just south of the "Hammerbrück" across the valley of the Gueul. Only high-speed trains will be allowed to run over it, at up to 240 km/h, twice the limit of 120 km/h on the present line which follows the valley of the Vesdre and has a disproportionate share of the SNCB's 8000 bridges. The total budget for new and upgraded infrastructure in Belgium (some of which will be also used by the SNCB's internal traffic) is BEF 188 billion (? 4,6 billion), of which the work east of Liège is currently estimated to cost BEF 27 milliards (?669 million). The president of the company responsible for managing the project on behalf of the SNCB, M. Martens of TUC-Rail, it reported to have stated : "The negotiations with the German authorites have been difficult, because they think cross-border routes don't have enough traffic to justify providing very high-speed infrastructure. And they have their own type of TGV, the ICE. We in Belgium are something of a punching-ball between France and Germany!" "En décembre 2006, le Bruxellois qui voudra utilser le Thalys pour faire des emplettes de Noël à Cologne ne restera que 1h 39 dans le train. Contre 2h 32 actuellement. D'ici là, l'équivalent de 40,000 camions de 20 m2 auront été évacué de la colline de Soumagne et d'impressionnant viaducs enjamberont les vallées du plateau de Herve. Un chantier colossal lancé entre Liège et la frontière allemande qui s'ajoute à celui en voie de finition le long de l'autoroute Bruxelles-Liège. pour ce tronçon dont le coût actuel est évalué à BEF 27 milliards (?669 million) pour BEF 188 milliards (? 4,6 milliards) pour le total des chantiers de TGV en Belgique. Avec les ouvrages d'art qui compléteront la liste de 8000 ponts et 114 tunnels qui composent l'infrastructure de la SNCB. Pour l'heure, seule le schiste circule sur la future assiette du cheval de fer des temps modernes. Tiré de la colline de Chèvrement à Chaudefantaine où les dumper et excavatrices commencent leur ballet de génie civil. Bientôt les taupes géantes entreront dans la danse, creusant un boyau de 6.2 km en légère pente. "On attaque le tunnel par quatre côtés pour aller plus vite," explique Yvan Couchard, responsable des travaux TGV à TUC-Rail. "Une attaque en-dessous, à Vaux-sous-Chèvremont, une autre à la sortie à Soumagne, et deux attaques dans un puits intermédiaire à Bay Bonnet. "[sud-est de Fléron] A l'explosif où avec des gigantesques foreuses, le tunnel doit être creusé à grande vitesse. Pendant quatre ans, c'est tout une usine mobile de 300 personnes - parmi laquelle on retrouve des anciens mineurs - qui va excaver, bétonner et solidifier ce boyau. Non sans poussières et autres bruits de grues et camions pour les riverains. "Lors de l'ébauche du pré-tunnel, nous avons déjà eu des petits dégats comme des bibelots cassés. Certains ont eu des fissures dans leur maison," a remarqué récemment Stéphane Merlo, un riverain du Bay Bonnet. Accompagnement, état des lieux, indemnisation éventuelle en concertation avec les communes traversées : l'attitude de TUC-Rail à l'égard des riverains concernés est connu. "Afin de préserver les habitants du bruit, nous avons décidé d'évacuer un maximum de terre par le tunnel lui-même, et non par la route," déclare Yvan Couchard. En outre, le chantier en surface ne sera ouvert que de 7h à 22h du lundi à vendredi, et de 7h à 14h le samedi afin de limiter le nuisances. Dans le tunnel, par contre, le chantier est ouvert en permanence. En amont de ce chantier pharaonique a été lancé la construction de la ligne vers l'Allemagne, où les trains rouleront de 220 à 240 km/h contre seulement 160 km/h sur la territoire allemande... si tout se passe comme prévu. "Les négociations avec les Allemands sont difficiles," confie M. Martens, président de TUC-Rail. "Ils ne voient pas l'intérêt d'investir dans les lignes à grande vitesse proches de la frontière, puisqu'ils ont développé un train à grande vitesse de leur propre conception. Nous sommes un peu le punching-ball entre la France et l'Allemagne!" Reste qu'en dépit d'une certaine inertie du côté allemand, les travaux en cours entre Liège et la frontière permettront de gagner 18 minutes entre Liège et Aix-la-Chapelle. Alors que, si le train à grande vitesse était passé par les voies modernisées de la vallée de la Vesdre, le gain de vitesse n'aurait été que de 8 minutes." Belgium's longest railway tunnel, excavation of which began in May 2001, is still under construction. On Saturday 12 October, the construction base at its eastern end will be open during a few hours for visits by local residents. Eight hundred thousand cubic metres of earth are to be moved, sixty thousand cubic metres of rock to be blasted away and 147,000 m3 of concrete are to be poured by a team of 250 workpeople who are busy in shifts 24 hours/day. These impressive figures indicate the scale of what is currently Belgium's biggest public works project. The double-track tunnel for the high-speed rail line between Liège and the German border will be more than 6 km long, and lie some 130 m below the surface at its deepest point. The tunnel is being driven from four faces: not only from its western end at Vaux-sous-Chèvremont in Chaudfontaine and its eastern end at Ayeneux in Soumagne, but also from the foot of a shaft 30 m deep excavated at Bay-Bonnet, about 2 km in from the Ayeneux end. Pierre Baar, the site engineer, explained that so far 510 m have been excavated at the Ayeneux end and 440 m at the Vaux-sous-Chèvremont end. 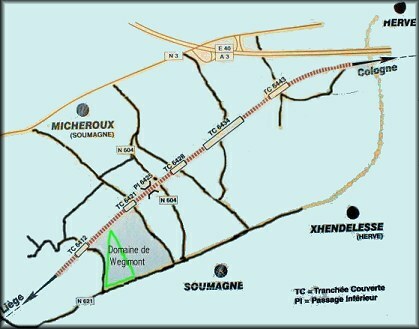 Another 380 m have been excavated using explosives westward and 280 m eastward from the intermediate shaft at Bay-Bonnet. If the current rate of progress, giving a total of 100 m per week, is maintained, the tunnel should be completed between Bay-Bonnet and Ayeneux in May 2003, and the remainder in July or August 2004. Pierre Baar is confident that this timetable will be achieved, so that work on equipping the tunnel for the new railway can begin in August 2005. 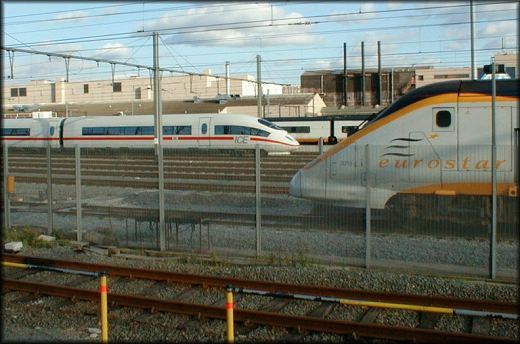 That, and the subsequent test programme, is due to be completed in time for the start of scheduled Thalys and ICE3 operation at 200 km/hr in December 2006. The sketch map above (based on one issued by TUC-Rail) shows the route of the new line eastward from the end of the tunnel at Ayeneux to the point near Herve where it starts to run beside the E40 motorway. Five short cut-and-cover tunnels are being built to take it through the ridges on which the local roads run (with minimum disturbance to the people whose homes are along them). Commencé en mai 2001, le plus long tunnel ferroviaire de Belgique est toujours en chantier. Ce samedi 12 octobre, le versant est du tunnel, à Ayeneux, sera ouvert aux riverains durant quelques heures. Huit cent mille mètres cubes de terres à évacuer, 60.000 m³ de roches tirées à l'explosif, 147.000 m³ de béton à acheminer. Le tout grâce au travail de 250 ouvriers qui se relayent 24 heures sur 24. Ces chiffres impressionnants traduisent bien l'ampleur du plus grand chantier de travaux public de Belgique. Le tunnel à double voie qui permettra le passage de la ligne à grande vitesse entre Liège et la frontière allemande s'étend en effet sur plus de six kilomètres, à une profondeur qui atteint en certains endroits près de 130 mètres. La galerie a été attaquée en trois endroits : à Vaux-sous-Chèvremont, dans la commune de Chaudfontaine, à Ayeneux, dans la commune de Soumagne, et dans la vallée du Bay-Bonnet, aux deux tiers du tracé, grâce au forage d'un puits vertical trente mètres sous terre, qui permet une attaque intermédiaire dans les deux directions. A l'heure actuelle, explique Pierre Baar, ingénieur chargé des travaux, nous avons creusé 510 mètres de galeries à partir de Ayeneux et 440 mètres à partir de Vaux-sous-Chèvremont. Au site du Bay-Bonnet, c'est 380 mètres de galeries vers Vaux et 280 mètres vers Ayeneux qui ont été dégagés à l'explosif. A ce rythme, nous devrions percer à Ayeneux en mai 2003, et à Vaux en juillet ou août 2004. Le tunnel avance à un rythme de croisière d'environ cent mètres par semaines depuis la mi-août. Pour le moment, tous les indicateurs sont au vert, insiste Pierre Baar. Le chantier devrait être terminé dans les temps. Commencé en janvier de cette année, ce véritable travail de fourmis devrait donc arriver à son terme en août 2005. Il restera alors à la SNCB et à TucRail, sa filiale chargée du chantier TGV, à rendre la ligne opérationnelle, à la fin de l'année 2006. Le Thalys pourra alors y circuler à une vitesse moyenne de 200 km/h." The start of running on the new high-speed line (L2) between Leuven and Ans provides the opportunity for a reorganisation of passenger services between Brussels, Aachen and Köln. Until 14 December, these consisted mainly of the ICA trains, running every two hours beweeen Ostend and Köln (taking 2h55 between Brussels M/Z and Köln Hbf) and the Thalys running every two hours beween Paris and Köln (calling only at Liège G. and Aachen Hbf, and taking 2h35 between Brussels M/Z and Köln Hbf). With effect from 15 Dec. 2002, the 7 daily Thalys TGVs will take only 2h22 between Brussels M/Z and Köln Hbf; they will all continue beyond Köln Hbf to terminate at Köln Deutz (but there will no longer be a daily Thalys working through to Dusseldorf). This will make connections available to/from additional points in Germany, notably Frankfurt-am-Main Hbf. which can be reached in 4h01 from Brussels M/Z. 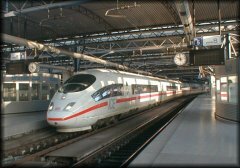 Indeed, three daily German high-speed trains, known as ICE3, will then run though between Brussels M/Z and Frankfurt Hbf in only 3h46, and this time should be reduced to about three and a half hours as soon as these trains are allowed to run on L2. These ICE3s are currently scheduled to leave Brussels M/Z at 6:14, 12:14 and 18:14, and to return from Frankfurt Hbf at 6:00, 14:00 and 18:00. 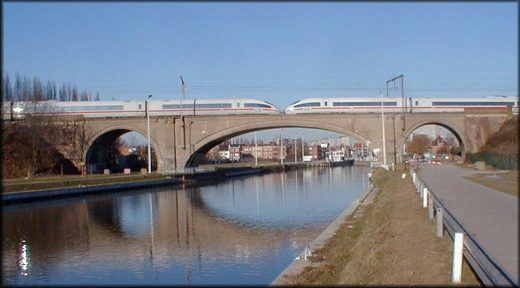 A new regional train service running every two hours between Liège and Aachen calling at Angleur, Pepinster, Verviers and Welkenraedt is being introduced on 15 December 2002. Designated as IRq, it is scheduled to take 48 minutes, with departures from Liège G. at 35 minutes past odd hours, and from Aachen Hbf at 37 minutes past even hours. All the ICA trains (hauled westbound and propelled eastbound by dual-voltage type 13 locos) will then run hourly between Ostend and Eupen, taking 3h03 - seven minutes less than previously, because they will be routed via L2 at speeds of up to 200 km/h. Le 15 décembre, les horaires des trains internationaux au départ de la Belgique seront quelque peu modifiés. Ces modifications concernent essentiellement les liaisons avec l'Allemagne La mise en service de la ligne à grande vitesse (LGV) entre Louvain et Liège, le 15 décembre, engendre une adaptation importante de l'offre de trains circulant entre Bruxelles, Aix, Cologne et Francfort Jusqu'au 14 décembre 2002, les gares de Aix et Cologne sont desservies par les trains ICA, au départ d'Ostende (Bruxelles-Cologne en 2h55,) et les Thalys Bruxelles-Liège-Aix-Cologne (Bruxelles-Cologne en 2h32). A partir du 15 décembre, les 7 trains Thalys poursuivront leur parcours au-delà de Köln Hbf (Cologne) et desserviront également la gare de Köln Deutz (Cologne). Leur horaire sera modifié: le temps de parcours entre Bruxelles et Köln Hbf sera de 2h22, soit un gain de 10 minutes. Ce gain de temps permet de réaliser, à Cologne, des correspondances supplémentaires vers des destinations allemandes. A partir du 15 décembre également, 3 trains allemands à grande vitesse - les ICE 3 - relieront Bruxelles et Francfort (Frankfurt Hbf) en 3h46. Ce temps de parcours sera encore sensiblement réduit lorsque les trains ICE 3 recevront l'homologation nécessaire pour pouvoir circuler sur la ligne à grande vitesse belge. L'horaire de ces trains: au départ de Bruxelles-Midi, ils quitteront la gare à 6h14, 12h14 et 18h14. Dans l'autre sens, au départ de Frankfurt Hbf, ils partiront à 6h,14h et 18h. Les liaisons transfrontalières avec l'Allemagne (= Aix), au départ de Liège, seront assurées par une nouvelle relation locale: le train IR q circulera toutes les deux heures entre Liège et Aix, et vice-versa. Des correspondances pour Cologne et le reste de l'Allemagne seront assurées en gare de Aix La liaison quotidienne Thalys vers Düsseldorf (un aller-retour quotidien) est suspendue à partir du 15 décembre. Des trains en correspondance vers Düsseldorf partiront de la gare de Köln Hbf (Cologne). Les IC A au départ d'Ostende emprunteront également la nouvelle ligne à grande vitesse, à 200 km/h. Ces trains ne circuleront plus au-delà de la frontière et auront Eupen comme gare terminus (avec toujours un arrêt à Welkenraedt)." Work has begun on rebuilding the railway between Aachen Hbf station and the Belgian border. The railway line Köln - Aachen - Liège is part of the European high-speed Paris - Brussels - Köln - Amsterdam rail network (PBKA). In this context, the infrastucture between Aachen Hbf station and the border with Belgium is being upgraded to allow trains to run at a higher speed - up to 160 km/h. The section concerned is about 3,200m long and includes the construction of a new single-track tunnel (Buschtunnel). Authority for the work was granted by the Planning Decision of 04 May 2001 of the Federal Railway Office in Köln. The Deutsche Bahn AG has set up the DB ProjektBau GmbH to manage the project. The main contract was awarded to an large consortium led by the Hochtief, Hartung-Bau and Eichholz companies. As a second stage, it is planned to repair the existing Buschtunnel (about 691 m long) and adapt it for single-track operation (the contract for this work has not yet been awarded). Some passengers have complained that the AM66 trains used for IRq services (Aachen - Li�ge) are rather old. But these are practically the only NMBS/SNCB EMUs approved for running on the DB tracks into Aachen.